Pencils Down, Pass the Remote: "Vampire Diaries" Finale: Damon is Saved, Stefan gets Awesome! 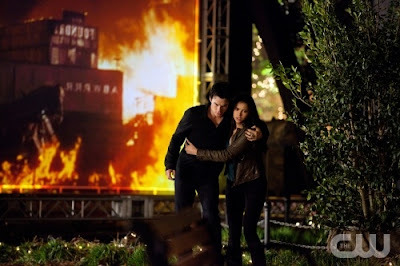 "Vampire Diaries" Finale: Damon is Saved, Stefan gets Awesome! I don't think there is any other show on TV that could produce what was basically a three-episode finale that was so packed with twists, turns and emotional moments and still managed to flow as beautifully as The Vampire Diaries did with "The Last Day," "The Sun Also Rises," and "As I Lay Dying." When a show with worse pacing (which, at this point, is pretty much every other show on TV) tries for the same thing, we end up with the final episodes of the third season of True Blood, and nobody wants that. Even Fringe only managed a two-part finale, and Fringe is just packed with awesomeness. One of the things I love most about The Vampire Diaries - besides the continually jaw-dropping pacing - is the way that, even in the midst of action-packed episodes like this season's final few hours, the writers always make room for some nice, character-driven moments. (You've probably figured this out by now, but there are major SPOILERS ahead if you haven't finished the season.) This is one of the many, many reasons that The Vampire Diaries is so much better than that other, much more sexually explicit vampire show; the plot twists, no matter how shocking, are always organic to the characters, and we the audience are always given character moments that make those twists plausible. One excellent example from the final episode comes when Stefan, always the nobler of the Salvatore brothers, agrees to go on a decade-long blood bender with Klaus in exchange for a cure for his brother. This moment works because the groundwork has been laid for it throughout the three-part finale, as well as the previous two seasons of the show. We've seen that, despite Stefan's tempestuous relationship with Damon, he loves his brother deeply, a conflict that was beautifully articulated in a conversation between Damon and Elijah in "The Sun Also Rises." Stefan, wanting to make sure that Elijah was going to go through with their plan and actually kill Klaus, explained that he had wanted to kill Damon a thousand times, but never had. That one line summed up the relationship between Stefan and Damon perfectly, and set up the kind of sacrifice that Stefan would be willing to make for his brother. Stefan's sacrifice, however, had been set up much earlier than that. Starting in the Season 1 episode "Under Control," we've been shown scenes of what happens to Stefan when he's drinking blood, and we can guess that, despite his attempts to get himself used to drinking blood by taking small sips from Elena, the dozen or so blood bags that Klaus forces on him are going to get the better of him. By the end of the episode, when the look in Stefan's eyes crosses the boundary into pleasure as he feeds off an innocent girl provided for him by Klaus, it's become obvious that Stefan has given himself over to the blood. This development promises an interesting role reversal between Damon and Stefan next season, one that none other than Stefan Salvatore himself, Paul Wesley, is excited about. According to an interview with producer Julie Plec, "Probably Paul Wesley's happiest day on set was getting to dive back into that side of Stefan." To me, the biggest, most emotional arc in the final three episodes was that of Damon's werewolf bite and Stefan's determination to save his brother. However, since much of the season had been building to Klaus' sacrifice and transformation into a werewolf-vampire hybrid, that storyline took up most of "The Last Day" and "The Sun Also Rises," and it was also a good one. The best element of the sacrifice, to my mind, was Joseph Morgan's performance as Klaus. Morgan played the big, bad vampire as a charming psychopath, who used Jenna as his sacrifice vampire purely because he wanted to torture Elena, and who let Elena think, just for a moment, that she would have to choose which vampire would be sacrificed: Stefan or Jenna. In terms of characters who are being set up for good arcs next season, Jeremy Gilbert is second on the list, right after the adventures of Klaus and Evil Stefan. After being killed by Sheriff Forbes and brought back to life by Bonnie and some reluctant dead witches, he ended the episode face-to-face with his two dead girlfriends, Anna and Vicky. Jeremy, while smokin' hot, has been given little to do this season other than date Bonnie, and his new abilities (whatever they entail) are extremely promising for his role in the third season. All in all, the second season finale of The Vampire Diaries kept up the unflagging pace and the dramatic plot twists that the show is known for, while also providing for some lovely character moments. I didn't even manage to touch on the scene between Elena and Damon in which he finally tells her that he loves her and she gives him a sweet, platonic kiss. It was a lovely moment in their relationship, and it gave the friendship between Damon and Elena some needed forward momentum. Their new closeness is promising for next season as well; while I'm not a Damon/Elena 'shipper, I can't wait to see how their relationship develops while they try to rescue Stefan from Klaus, which I assume they will. The final three episodes of The Vampire Diaries did an excellent job of setting up the next season while wrapping up this season's major storylines. We even got to see Klaus shirtless. Really, what more can you ask for in a finale?